1/1/18 update: we have now reached capacity for this series–thank you for your interest! If you’d like to be added to the waitlist or to receive an email about additional Yoga for All series or classes, please send an email to 4yoga.me@gmail.com. You may also be interested in our other January series, focused on wellness, and you can read more about it and register here. 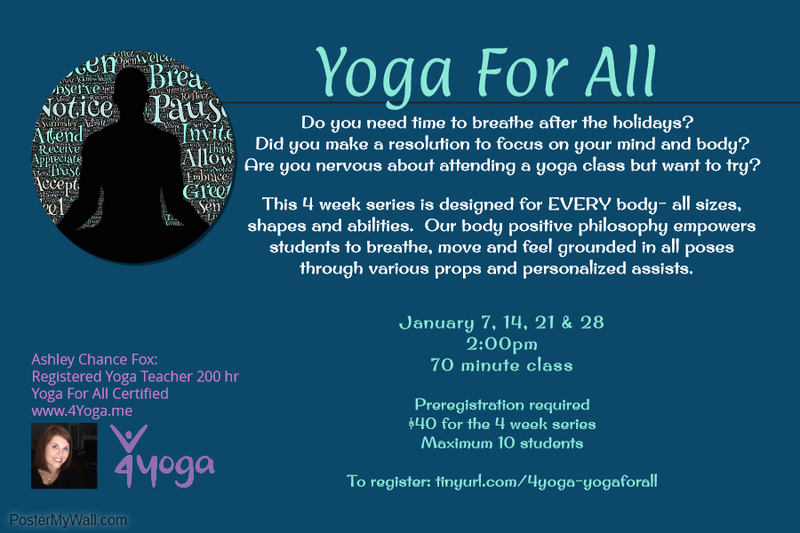 We are excited to announce that registration for the 4-week January Yoga for All series is now open! See the flyer below for details, and use this registration form to sign up! For more information about Ashley and her Yoga for All training, check out our recent Training Thursday post. This entry was posted in new class, schedule, styles of yoga and tagged Ashley Chance Fox, January, Yoga for All. Bookmark the permalink. 1 Response to January Yoga for All series: registration open!